The world Creatonia is populated with various creatures that may be friendly or hostile, that may be alike or different. But all the wars and feuds stop for the period of the Great Gods Uprising Tournament, and warriors from the very far parts of the world come to tourney. Mobile game maker Inscenic has released one of the company's older video games as freeware. 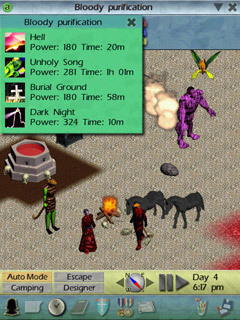 Creatonia is an RPG designed to run on Windows Mobile and Palm devices. The game is pretty typical fantasy RPG fare. You get to customize a character which will wander through various quests while battling different creatures using weapons and magic. The graphics aren't exactly PS3 quality, but for a mobile game, Creatonia looks pretty good and is fairly responsive, even on older devices. And most importantly, while most of Inscenic's games cost between $10 and $15, Creatonia is now free.